Location: 36 E 8th St.
-The owners behind Somtum Der's new spot, Kiin Thai focus on home-style central and Northern Thai cooking. - Kiin means "eat" in Thai. Indeed, lots of lots of great eating happens at this place. -With a plenty of small dishes available, this is a perfect place for family style dining with a large group including the NYU students nearby. 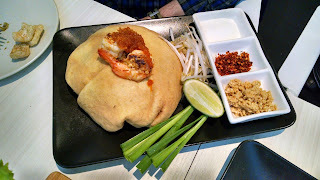 -Even ubiquitous Pad Thai ($15) is better here and good for sharing. The condiments like peanuts and chiles are on the side, and the noodles packed with fresh ingredients are wrapped in an egg crepe. 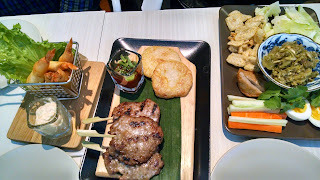 -"Grandma's Grilled Pork and Sticky Rice" ($13) is like a deconstructed sticky coconut rice burger. -No dish is Americanized here except the tap water and some beer selection. Prepare for some complex flavors.